Have you ever felt like you weren't good enough? Sometimes in the equestrian world it seems like everyone else has their act together except for me (am I the only one whose car has arena grit on the floor and sports alfalfa bits in my purse?). Thanks to Heather's authenticity in storytelling I feel less alone juggling the work/life/barn life situation. The chapter about her daughter as her hero is really special, and as tender as her voice can be, in other parts her fun, snarky side comes out (but not too snarky). What I really enjoyed as I read this book is that I felt like she was having a conversation with me. Her voice is very strong and she is not shy about delving into her personal joys and struggles. Timid rider or not, if you are a grown up horse girl who likes a good story, you'll feel like you made a new friend by reading Heather Wallace's memoir. The book was short but good. It was easy to identify with Heather Wallace. I was ran away with many years ago. I had a horrible, horrible cold. The barn manager's wife and I were riding with the owner of the estate, trying to keep him out of trouble and the horse out of harm. We had stopped to let the horses breathe. I looped the reins around my wrist so I could blow my nose. Mid-blow, the old gentleman took off and the heavy hunter I was riding bolted towards a low chain link fence. Never have the pointy bits on top of a chain link fence looked so pointy. On the other side of the fence was a cornfield. Running into the cornfield that stopped the horse. I have never felt truly comfortable galloping a strange horse cross country since. And that makes me a timid rider who has learned to ride through any fears I may have. This is the perfect book for a summer afternoon. It's a quick and easy read, with wonderful insights that easily translate into experiences everyone can relate to - not just riders. When I read Heather's story, it was surprising to me how similar her character was to my own, and how often I recognized myself in her pages. I loved the way she tied the theme of each chapter to a life lesson. While of course she does refer everything back to her experiences on horseback, her subtitled 'confessions' under each chapter heading in part two are easily extrapolated into every day living. If there is one criticism, it is that I would have enjoyed seeing more photos of the animals and people she talks about! The final paragraph says it all and sums it up quite nicely, "face your fears and push through them however you can to follow your passion!" "Heather P Wallace’s nonfiction memoir, Confessions of a Timid Rider, is a marvelous and inspirational work written by an author who has repeatedly faced her fears and accepted the inevitable setbacks as they occur, and still has managed to live her dreams. I loved reading about her experiences with her horses, especially Earthly Delights. Her frank and honest discussions about anxiety and the “what-ifs” that can work to deprive one of their self-confidence are quite helpful, and I’m sure anyone who reads this remarkable book will see themselves in at least some of Wallace’s work. Readers are fortunate indeed in Wallace’s other love being writing, which she does well. Her memoir is a joy to read. I finished it having learned a lot about horse and equine behavior, but I also was a witness to her triumph over that timid aspect of herself on almost every page. Wallace’s courage and resilience is something to cheer about, and her memoir records it brilliantly. Confessions of a Timid Rider is most highly recommended. " "You might actually know Heather from reading her horse and dog blog! She recently rebranded Bridle and Bone to The Timid Rider (www.timidrider.com). Heather lives on the East Coast, is a mom of three, and when she’s not writing about returning to riding as an adult, she’s probably working on one of her animal massage clients. And when she’s not massaging a furry friend, she’s probably riding her adorable roan pony Ferrous. I haven’t read this book yet, but I’m a fan of memoir and a fan of Heather, so I’m sure it will be snarky and fun. (And at the time of this writing the book is ranked #1 in Amazon’s “Equestrian Sports” category!)" "A personal account of overcoming fears which stretches beyond riding horses and more facing what fears you the most in life and, no pun intended, taking life by the reins." "I was very impressed with Wallace’s honesty and candor as she shares her personal struggles. Frankly, I think she underestimates herself. I found her to be like the Cowardly Lion – anxious, yes, but actually very brave. 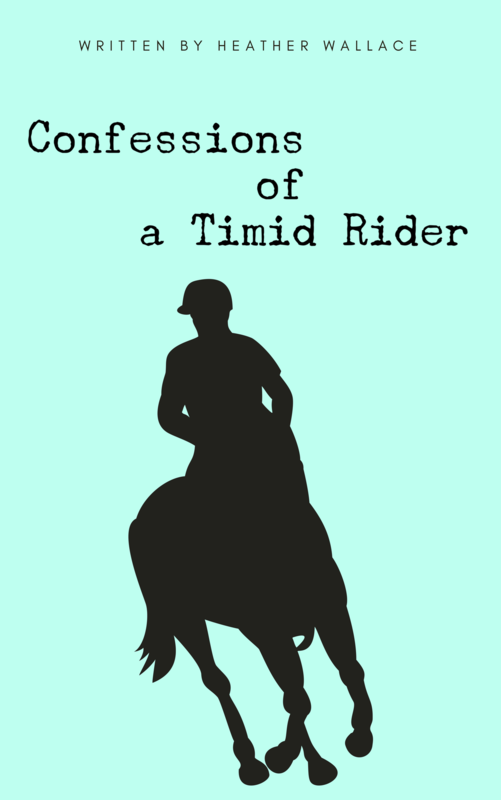 Confessions of a Timid Rider will appeal to horse lovers, but also to people who are looking to overcome their own anxieties to accomplish their dreams. It is helpful to know a little about horses, but you don’t have to know much to enjoy Confessions of a Timid Rider. I found the book to be conversational and relaxing to read. Make yourself a cup of coffee and enjoy the heartfelt writings of Heather P. Wallace." I think many people—especially women—will appreciate her struggles with confidence and will delight with her as she reveals how she worked her way through.